A team led by Prof. XU Cao at CEPAMS and Prof. GAO Caixia at Institute of Genetics and Developmental Biology, Chinese Academy of Sciences, present a strategy to develop new crops. They achieved rapid domestication by precisely introducing desirable agronomic and nutritional traits into wild tomatoes that are resistant to bacterial diseases and salt stress using CRISPR/Cas9 genome editing, producing a new type of tomato. Since Neolithic revolution around 10,000 – 7000 years ago, hundreds of plant species have been domesticated from wild relatives to adapt to the cultivated environment or human cultural preferences. This laid the foundation of agriculture worldwide and greatly shaped the our culinary and eating habitats. However, as an expanse, modern crops display a rather high dependence on human intervention and agricultural facilities, and are very much susceptible to disease, pest and ever-changing environment. Wild species preserve extensive resistance to environmental challenges and rich genetic diversities. Classical breeding conventionally introduced alleles from wild relatives into cultivated, which involves great effort and much time, and usually leads to failures. 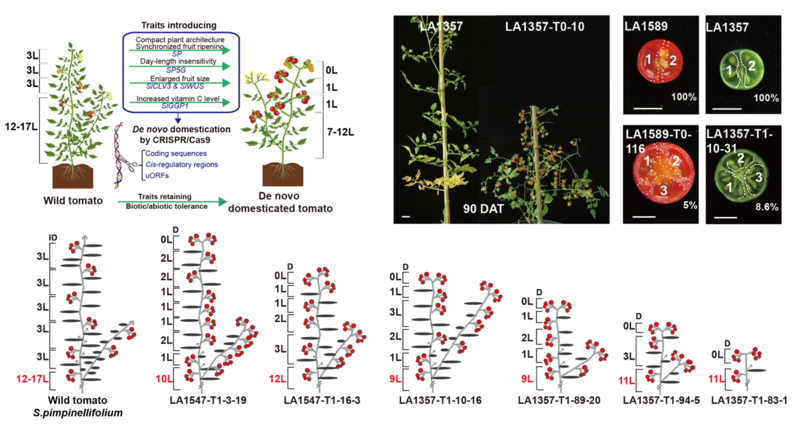 Innovatively, using tomato (Solanum lycopersicum) as example, Prof. XU’s team collaborated with Prof. GAO’s lab demonstrated that wild tomatoes could be de novo domesticated by directly manipulation of their genome context and meanwhile harnessing their adaptation to the adverse environments. De novo domesticating wild tomatoes for commercial cultivation need to overcome their following drawbacks. First, they are late flowering and usually sensitive to day-length, which limits their geographical range of cultivation. Second, they have indeterminate growth and sparse fruit setting with asynchronous ripening which makes the yield low and harvesting difficult. Furthermore, their fruits are incredibly small with a low nutrient content. 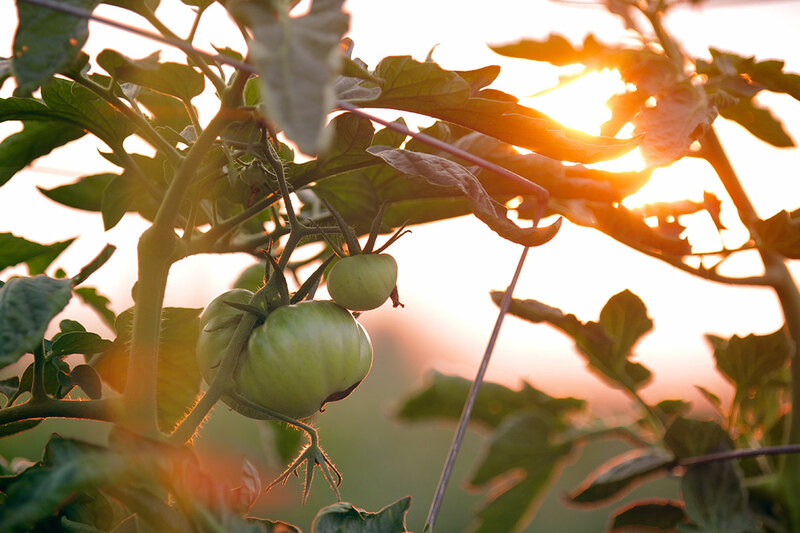 Researchers harnessed the untapped power of genome editing to improve wild tomatoes. They used a CRISPR system armed with multiplex guide RNAs that target coding sequences, cis-regulatory regions and upstream open reading frames (uORFs) of flowering, photoperiod, plant architecture, fruit size and ascorbic acid synthesis related domestication genes. Stackable allelic variations were introduced into four wild tomato accessions. In T0 generation, over 100 plant variants with a broad continuum of agriculturally important traits, such as plant architecture and overall plant shape, fruit size and production, and vitamin C content, were rapidly generated. This is the first report that manipulation of wild tomatoes can begin to recapitulate breeding without causing an associated drag on other useful traits. Genome engineering could thus be applied for de novo domestication in all food, feed, and fuel crops, including staples rice, maize, sorghum and wheat, to create nutritious and climate-smart crops. This story entitled “Domestication of wild tomato is accelerated by genome editing” was published in Nature Biotechnology (DOI:10.1038/nbt.4273) on Oct. 1, 2018. The work was supported by National Key Research and Development Program of China, the State Key Laboratory of Plant Genomics, National Science Foundation of China, Chinese Academy of Sciences, and the Thousand Talents Programme. Figure 1 Genome editing introduces desirable plant architecture, day-length insensitivity flowering and enlarged fruit size traits into wild tomatoes in one step.